« Knowledge Matters: Why is the Core Knowledge Curriculum Experiencing a Revival? 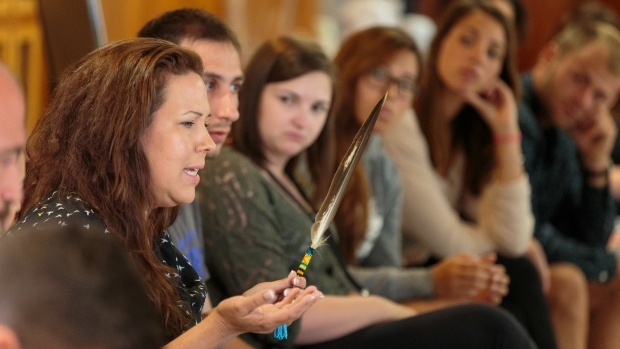 First Nations Control of Education: Will Teach for Canada Be a Critical Piece in the Transition? Every September a fresh crop of hundreds of mostly novice teachers head North to teach in remote, mostly First Nations populated communities. Hired by northern public school districts or aboriginal education authorities, the recruits arrive flush with excitement and prepared to ‘sink or swim’ on a mostly unfamiliar educational terrain. This year is different for one reason: Teach for Canada (TFC) is a new ‘wild card’ on the educational scene and it’s an independent NGO committed to addressing the teacher shortage, filling vacant teaching posts, and ‘closing the education gap’ affecting Ontario’s northern First Nations communities. Although welcomed by most First Nations chiefs and lead educators, TFC has received an icy reception from the Canadian Teachers Federation (CTF) and vocal teacher union activists. When teacher unionists see the Teach for Canada logo with its quintessentially Canadian flying geese, they see its big bad American counterpart, Teach for America, and the thin edge of the wedge of creeping “privatization.” They are also leery of TFC recruits signing on with First Nations schools for salaries off the public school grid. Since its inception, TFC has not only sparked a series of openly hostile teacher union blog posts, but prompted the CTF to issue a “Briefing Document” and greet the new TFC graduates in August 2015 with a condemnatory media release. Northern Ontario public school boards have been slow to react to the TFC initiative. This is perhaps understandable because, right from the beginning, they too have been reluctant to embrace Teach for Canada. True to form, they have been disinclined to acknowledge, let alone respond to, this initiative from outside the system. The initial Teach for Canada project only got off the ground in the Ontario North when the Nishnawbe Aski Nation (NAN) based in Thunder Bay, Ontario, jumped at the opportunity to secure motivated, committed and eager new teachers for their remote, far-flung elementary schools. Fresh from a four-week training session, including a five-day stay at Lac Seul First Nation, Martin and the first cohort of Teach for Canada recruits are better prepared than any previous group of teachers destined for teaching in First Nations communities. Sweeping condemnations of educational innovations originating outside the system are all too common. From the ground level, it looks like a positive development, if only as a transitional program. The ultimate goal is, of course, to provide First Nations education by fully qualified indigenous teachers. It will not happen if we keep shooting down promising teacher recruitment and training projects. Why have First Nations communities in the Ontario North embraced Teach for Canada? What’s really driving the resistance mounted by the Canadian Teachers Federation and outspoken teacher union activists? Who can complain when previous teacher preparation for teaching on First Nations reserves was so limited? Is it possible that Teach for Canada is what is needed to spark the transition to First Nations education delivered by indigenous teachers? The last thing we need in Canada is T4C. TFA is a disaster in the USA. There is very little need for innovation in the education system. What is needed is funding and support. Innovation generally means technology that has no supporting research to support it. Classic teacher bashing. Never accounts for the fact that all over USA and Canada unionized teachers get better results. So says CD Howe, OECD all leading nations and sub national jurisdictions HIGHLY unionized. Finland,Japan, Korea all highly unionized. It’s too bad that Doug Little didn’t bother reading the article. TFC is not TFA, it is not affiliated with TFA, and it is an entirely different model. It hires only education graduates, and provides them a month of additional, specific, cultural training. If a policy is not approved by teachers unions representing the profession in Canada, it should never go forward.